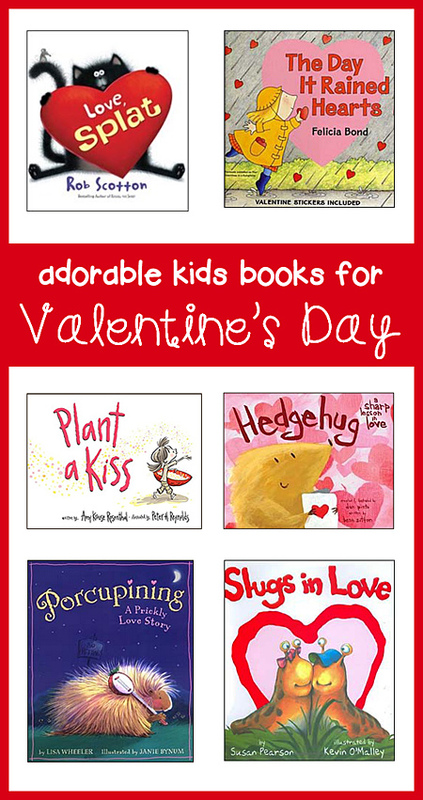 Kids Valentine's Day Picture Books! Adorable!!! A little hedgehog is super excited for Valentines Day and emerges from his burrow eager to find someone to give his special handmade Valentine to. Unfortunately, for hedgehogs, finding love can be a 'prickly' problem. But, after all hope seems lost...well, we won't spoil the ending, but rest assured it's a happy one. :) This sweet little hedgehog will capture your heart! Little Miss plants a kiss and tends to the little seedling until it's ready to share with the world. This book isn't specifically about Valentine's Day, but its message of love and kindness and giving make it a great fit. The pages have a minimalist style--with few words and simple, whimsical illustrations--but it works and reminds the reader of the joy that comes from spreading love. The spunky little Lilly loves her red-foil-wrapped chocolate hearts and has just one left. She wants to hide it but is having a hard time finding a place that's not too warm, too tight, to dusty.... Finally she finds the "perfect" place--her mouth! 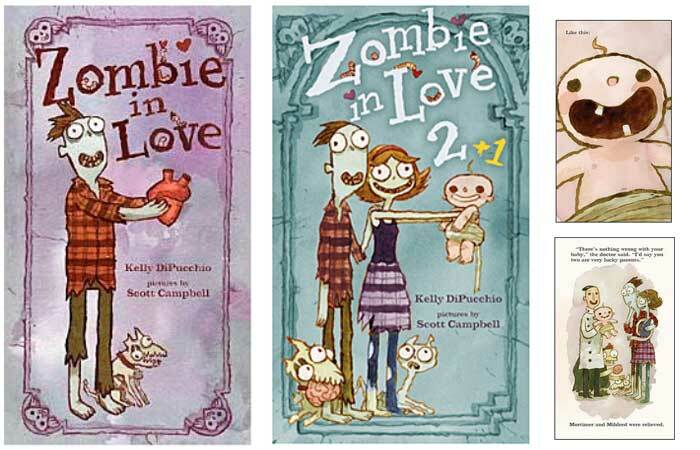 The premise is simple but fans of the Lilly books will definitely want this cute little Valentine's Day book. A little boy creates Valentines for his loved ones---his pets, family, even his teddy bear--describing how they could spend time together "if you'll be my valentine." What a sweet book! The activities that the little boy offers his loved ones definitely rings true to little kid sensibilities (ie: he tells his dog "If you'll be my valentine/I'll give you extra treaties./I'll give you two/and maybe three/and let you lick my feeties.") A great lead in to having kids create their own Valentines to give out. It's Valentine's Day and Fancy Nancy has a mystery on her hands: Who sent her the extra special Valentine? Join Nancy as she follows the clues and solves the mystery. Fancy Nancy is so over-the-top girlie (in an adorable way) that we generally don't read many books in this series as whole class read alouds, since we'd lose most of the boys from page one. However, Valentine's Day is such a frilly-mushy-pink holiday that a book like this one actually goes over beautifully. Fancy Nancy is a natural fit for Valentine's Day. 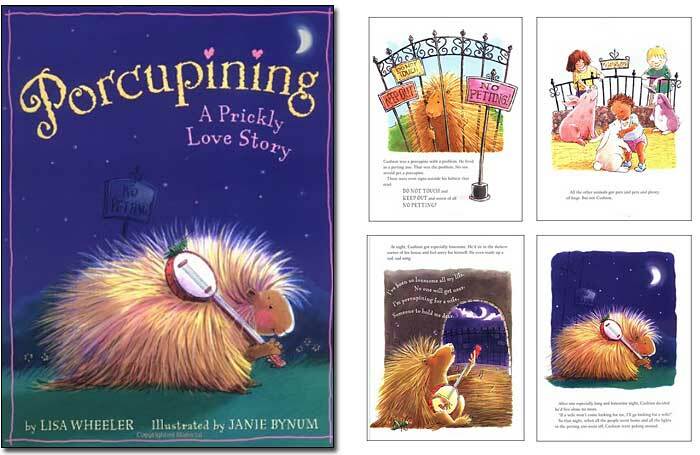 Cushion the porcupine feels like the most unloved animal at the petting zoo, so he sets about finding love and friendship through a series of heartfelt serenades. His efforts don't seem to be getting anywhere until he meets Barb, the hedgehog and it's love at first sight! 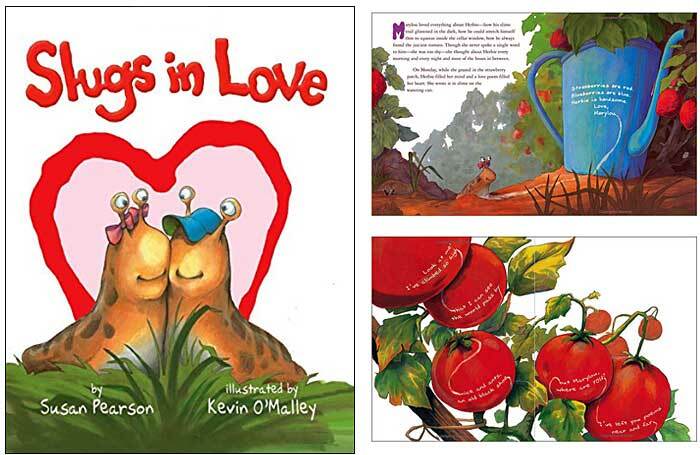 Shy slug Marylou uses her slime trail to write love poems to Herbie the slug, who responds with a rhyme of his own, but a series of unfortunate circumstances prevents her from finding them. At last, she sees it and they meet and fall in love. This book took us by surprise. Who'd have thought a book about slugs could be so adorable and clever! It's not specifically a Valentine's Day kids book, but it's definitely our favorite for the holiday! Also, this book also touches on letter writing, determination, poetry, and kids even learn a little about slugs! Little Cornelia is caught in quite an unusual downpour and she knows just what to do! Delighted to see that it's raining hearts, she eagerly catches them as they fall, rushes home, and turns each unique heart into a special Valentine for someone she loves. What a sweet little book. Felicia Bond's (If You Give a Mouse a Cookie) darling illustrations are a perfect fit for this simple storyline. 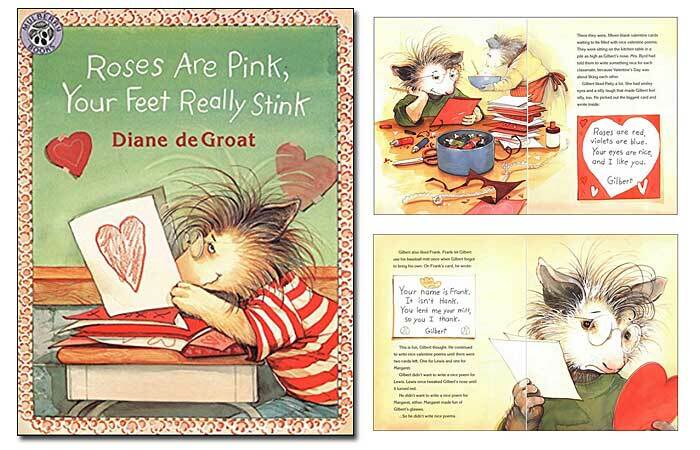 Read this book aloud before having children make their own Valentine cards! Poor Henry. He's in love with his fellow Kindergarten student Chloe, but he's too shy to do anything about it. How can he ever break the ice? This slight book is short on plot twists but HUGE on charm! Peter McCarty's simple characters are truly adorable and, just as in his Hondo and Fabian, the magic in this gentle book lies in watching as "an unexceptional day turns suddenly into an exceptional one." (Booklist) A New York Times Best Illustrated Book of the Year! "Kisses on noses, kisses on toes-es. Sudden kisses when you least supposes." This title looks at love among the animal kingdom, with a cute little penguin as the guide. It is definitely over-the-top on the cute factor and probably too young for elementary aged children, but we adore the rounded, almost plump characters in Abbot's illustrations so we're squeezing it into this list anyway. If you teach very young ones or want a super cute book for your own children, this is a great choice. 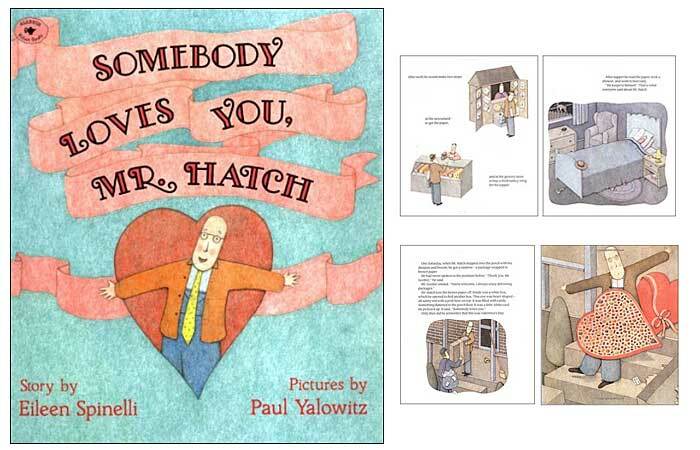 This touching book tells the story of an ordinary man who leads a boring life until a candy-filled heart arrives at his house saying "Somebody loves you." This greatly improves his outlook, making him more friendly and happy. When he learns the heart was a mistake and he's sad, his new friends rally around to show him he's cared for. This sweet story is quite popular due to how powerfully it teaches what a difference caring for others can make. Yalowitz's illustrations are a great fit for this story. We especially like how the colors slowly change from dull to bright as Mr. Hatch's whole outlook brightens. Little Olive is off on another holiday-themed mission, this time to return a large heart she believes was accidentally left behind by its owner. With the help of a spider and a squirrel, she tracks down the 'owner', only to find out that the heart was meant for her after all! We adore Olive the Other Reindeer, so we were eager to get our hands on this sequel...and, well, it's not quite as good as the first title but it's still a lot of fun. Perhaps we had too high of expectations. 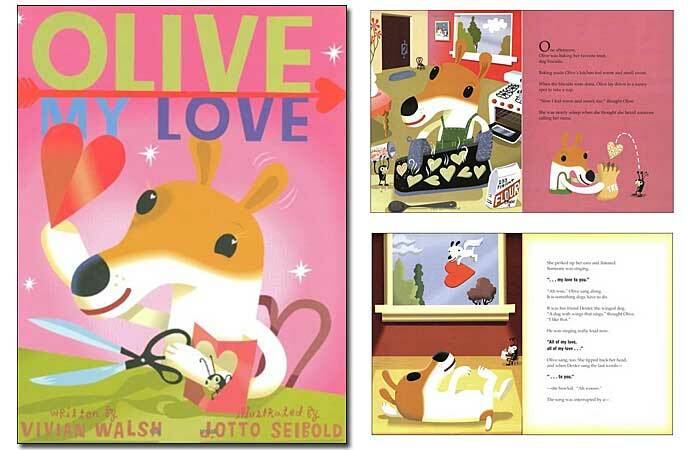 :) Siebold's illustrations are as quirky and fun as in the original, and little Olive is equally endearing. The book isn't specifically about Valentine's Day, but the message of loving others makes it a good fit nonetheless. Gilbert writes unkind Valentine poems for two fellow students and signs their names to the poems. When his actions are discovered, he's ostracized until he musters the courage to apologize and make amends with new poems and homemade cookies. We like that this book is more than just another cute story about exchanging Valentines. Children understand his dilemma, and learn from his example of apologizing and making things right. A great discussion starter! Told to the folk song "My Darling, Clementine" this title shares the story of a bashful man who sends love messages to his sweetheart but each meets with a mishap and never arrives. At the end, even though she never receives any of his messages, she travels from her home across a canyon to deliver special treat just for him. 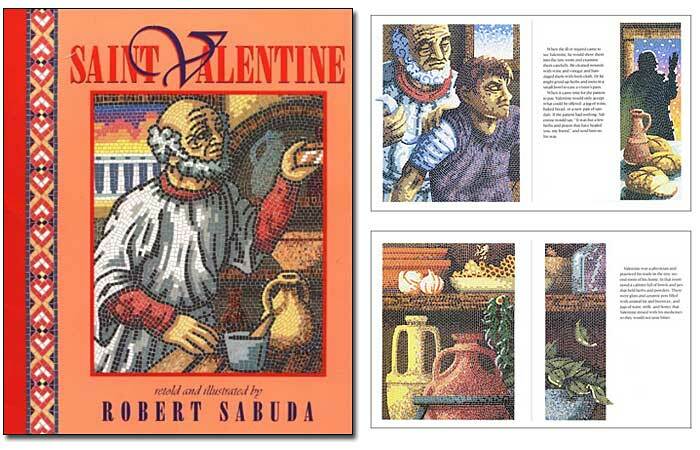 In their review, School Library Journal said "Without ever being treacly or melodramatic, this fun book is ideal for Valentine's Day programs." Bloom isn't like the other pigs. He doesn't want to grunt and play in the mud. Instead, she likes pretty, happy things, and would rather frolick in the flowers all day. When a beautiful butterfly flutters by, Bloom immediately falls in love with the 'flying flower'. Is this the love she's been searching for? "As light and sweet as cotton candy, this saga of a pig in love will win over kids and grownups alike..a beguiling version of love at first sight...A natural for Valentine's Day." (Publisher's Weekly starred review). Little Mouse just can't quite figure out what his big sister is doing with all the frilly, "smooth and rosey", "white and holey" items that she's collecting around the house. Finally, after a bunch of cutting, pasting, and arranging, Minka presents her little brother with a Valentine just for him. This book is so sweet! The premise is as simple as they come, but Erdogan's pink, purple and red illustrations are adorable. The perfect lead-in to a Valentine crafting activity. Zombie in Love-- Mortimer is looking for love. He's tried gym (but his arm wouldn’t keep falling off), at dancing lessons (but he's a bit too stiff), and even online dating. What's a zombie to do? When all hope seems lost, will Mortimer’s dreams ever come true? After their tireless preparations for the upcoming Valentine's Day, little Ruby and her pet cockatoo accidentally sleep in and almost miss the day entirely! As they rush to deliver their Valentines around town, they soon realize that they don't have to wait for Valentine's Day to tell people how much they care! School Libr. Jrnl. 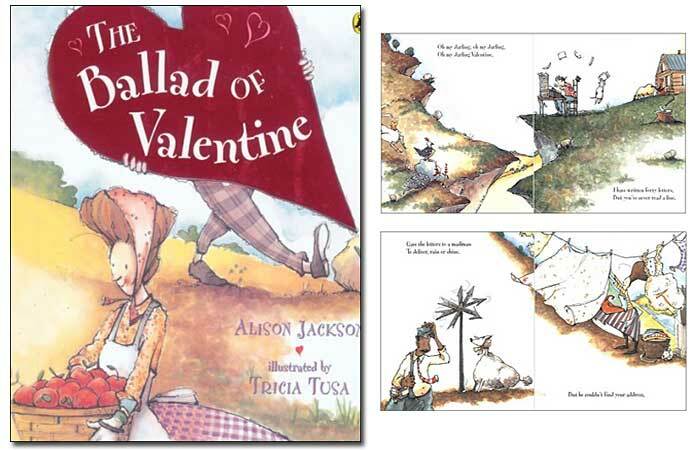 suggests that "this story, told in rhyme, should take a prominent place on Valentine's Day bookshelves." Ruby and her pet cockatoo are back and this time they're planning an elaborate Valentine's Day party. But, when the big day arrives, a snowstorm blows in and none of the guests can make it up the hill to attend the party. Can Ruby come up with a solution? We love the moral of the story--that time spent together is more important than gifts and trinkets--and Cravath's illustrations are truly adorable! And if you're looking for Valentines-themed chapter books, check out Junie B. Jones and the Mushy Gushy Valentine -or- Cam Jansen and the Valentine Baby Mystery -or- any of the other kids Valentines Day chapter books listed below. All very popular and fun to read around during the Valentines 'season'. 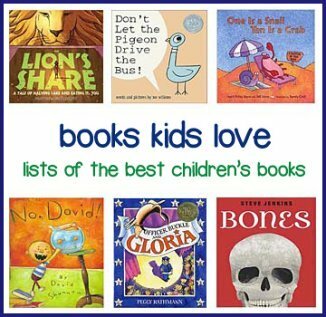 Did we miss any good kids valentine's day books?